A Rheumatologist is a doctor who is qualified by additional training and experience in the diagnosis and treatment of arthritis and other diseases of the joints, muscles and bones. Rheumatologists treat arthritis, certain autoimmune diseases, musculoskeletal pain disorders and osteoporosis. There are more than 100 types of these diseases, including rheumatoid arthritis, osteoarthritis, gout, lupus, back pain, osteoporosis, fibromyalgia and tendonitis. Some of these are very serious diseases that can be difficult to diagnose and treat. If musculoskeletal pains are not sever or disabling and just last a few days, it makes sense to give the problem a reasonable chance to be resolved. However, sometimes if pain in the joints, muscles or bones is severe or persists for more than a few days, you should see your physician. Many types of rheumatic diseases are not easily identified in the early stages. Rheumatologists are specially trained to do the detective work necessary to discover the cause of swelling and pain. It’s important to determine a correct diagnosis early so that the appropriate treatment can begin early. Because some rheumatic diseases are complex, one visit to a rheumatologist may not be enough to determine a diagnosis and course of treatment. These diseases often change or evolve over time. Rheumatology usually involves the continuing care of chronic patients. Dr. Shroff will work closely with you to identify your problem and design an individualized treatment program specifically for you. 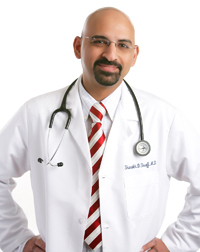 Dr. Shroff has been a practicing rheumatologist at the Spectrum Medical since July 2008. He is Board Certified in both Rheumatology and Internal Medicine. He specializes in the treatment of rheumatoid arthritis and other diseases of the joints including osteoarthritis, gout, lupus, osteoporosis, fibromyalgia and tendonitis. He previously worked at the Arthritis and Osteoporosis Center of Brooklyn, New York. He did his Internship training at the Long Island College Hospital in Brooklyn, NY and completed his Internal Medicine residency at Drexel University College of Medicine in Philadelphia, PA. Thereafter, he completed his Rheumatology fellowship at the National Institutes of Health (NIH) in Bethesda, MD during which time he rotated at Johns Hopkins University Hospital and the National Naval Medical Center. He is also trained in Musculoskeletal Ultrasound at the Mayo Clinic in Rochester, MN. 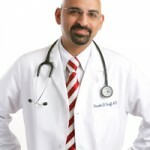 Dr. Shroff has a Masters degree in Public Health from Johns Hopkins Bloomberg School of Public Health and a Masters degree in Business Administration from the University of New Haven. His experience of working for over 6 years in clinical research in the Industry as a Clinical Scientist and Medical Research Associate gave him a unique exposure to research methods in medicine and serves him well as both a Sub-Investigator and a Principal Investigator in the clinical trials that arebeing run both in the fields of Rheumatology and Orthopedics at the Orthopedic Center in Danville. He is a member of the Rotary Club of Danville and believes in giving back to the community, volunteering his services at the Free Clinic in Danville, Virginia. In fact when Dr. Shroff was in India, he volunteered his services at Rotary-sponsored eye camps where he performed cataract surgery and administered facial and retro-orbital anesthesia. He also offered voluntary medical services at Mother Teresa’s home for the destitute and even received a personal note from her. His spirit of helping the underprivileged continued when he came to the U.S. and volunteered at Yale New Haven Hospital in both the Emergency Room and Pediatric Intensive Care units. Dr. Shroff says he is honored and privileged to serve a patient population who is so appreciative of everything he does for them. He has learned to embrace Southern culture and feels the warmth and genuine gratitude of his patients which can only be described as “Southern Hospitality”. Dr. Shroff receives great satisfaction from seeing patients who have been referred to him by other patients and often sees entire families. Still, his greatest joy is in seeing patients get better.